One of the foundations of our collaborative art practice is the act of shared seeing. We find common ground by actively investigating our own visual reference points, memories and assumptions. Whenever we make a new work, we also try to activate the common visual vocabulary of the local community and in this way, we hope to include our audience in the process of our shared seeing. For this work at CMCA, the subject matter is borrowed from Maine’s rugged coastal landscape and the tradition of artists who have explored the interplay of its natural forces, people and built environment. This work is a departure for us in two ways. We began collaborating in 2005 and all of our previous works have been made of paper (this piece is made entirely of wood). Second, it is the first time in one of our installations that the path through the piece has become an active element. Our goal was to find a way to translate the visual language we have developed in paper to a new material, but the impact of incorporating the pathway into the work was a surprise. Typically, the viewer makes contact with the gallery floor when they navigate our installations, but at CMCA the path contributes to the experience of the work as a whole. 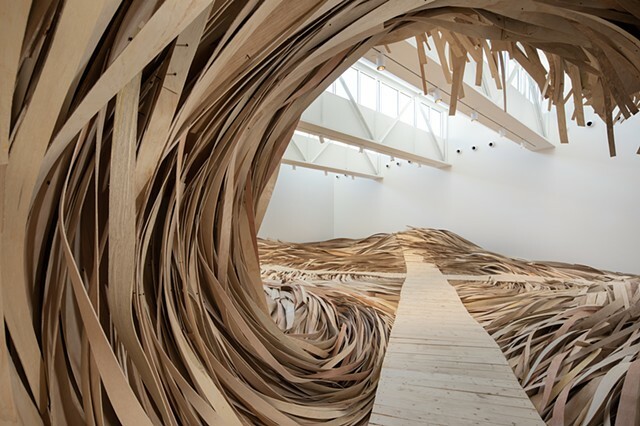 The viewer is made aware of the movement of the artwork through their own movement over the undulating boardwalk. By unifying this relationship between the “path” and the “piece,” the viewer is completely immersed in the work, removing the layer of separation between art and viewer. The interaction between the “path” and the “piece” lends this work an unexpected narrative arc, that of “Hubris, Atë, Nemesis,” familiar in Greek Tragedies, but maybe less so to most of us. Hubris, characterized as an arrogant confidence, transforms to Atë, a ruinous folly or madness, then ultimately to Nemesis, a force of retribution that resets the natural order. Like many paintings of the Maine coast, we hope this work captures a moment of suspense in a dynamic system -- a snapshot with an uncertain future -- and that it appears to be unwritten what the restored natural order should or might become.